Manzil Downtown, an upscale lifestyle hotel ideally located in the heart of Downtown Dubai, has won the impressive title of ‘Best Boutique Hotel in the Middle East’ at two major awards – The Haute Grandeur Global Awards™ and 2018 World Luxury Hotel Awards. The honours acknowledge the hotel’s commitment to offering distinctive guest experiences, sophisticated facilities, and outstanding services to both business and leisure travellersfrom all around the globe. Established in 2006, World Luxury Hotel Awards is the pinnacle of achievement in the luxury hotel industry offering international recognition as voted by the public, across more than 100 different categories. Over 300,000 international travellers vote each year, during a four-week period to select the winners at continental, regional and country levels. Manzil Downtown was awarded ‘Middle East’s Best Luxury Boutique Hotel’ for providing inspiring lifestyle experiences and setting a new standard of excellence in the region. Recognised as the most prestigious event on the luxury hospitality calendar, The Haute Grandeur Global Awards™ ceremony brings together a guest list of esteemed industry VIPs, influencers and personalities. The awards celebrate the best hospitality experiences, recognising the world’s most exceptional hotels, spas and restaurants across seven continents, 172 countries and 90 categories. Overlooking the iconic Burj Khalifa, Manzil Downtown is designed to appeal to global urban travellers who want to discover a modern twist on Arab hospitality in an urban, contemporary yet comfortable ambience. 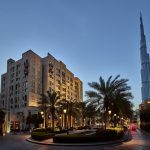 The hotel focuses on engaging guests through world-class lifestyle experiences and is conveniently situated within walking distance from The Dubai Mall, Dubai Opera and other major tourist attractions. With eight Burj View suites, over 200 spacious rooms, three vibrant restaurants, seven unique meeting rooms, a fully equipped gym and luxurious pool offering amazing views, Manzil Downtown is the perfect place for business and relaxation.